Aleks Obabko is actively working on advanced reactor thermal-hydraulic modeling. 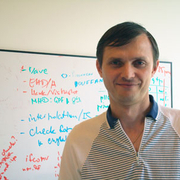 He currently is head of an ALCC (ASCR Leadership Computing Challenge) project titled "U.S.-Russia Collaboration on Verification and Validation in Thermal Hydraulics: Nek5000 and Conv3D Simulation of "Siberia"Experiment," for which he received 30 million hours on the IBM Blue Gene systems. He also is a fellow of the Argonne/University of Chicago Computation Institute.